Deleting one sentence from the Illinois Constitution will make Illinoisans vulnerable to extra charges atop their income taxes under a constitutional amendment championed by Gov. J.B. Pritzker. The Illinois Constitution currently bars the state from imposing more than one type of tax on income. But Pritzker’s amendment scraps that language, allowing Illinoisans to be taxed more than once on the same dollar earned. The Senate Executive Committee held a hearing yesterday and by a 12-5 vote passed the amendment, SJRCA 1. It next goes to the Senate floor. If Pritzker’s amendment becomes part of the Illinois Constitution, the state could adopt an extra income tax surcharge dedicated entirely to pensions, for example. A quarter of the state budget is currently consumed by pension costs, and a 2018 report published by the Federal Reserve Bank of Chicago suggested a 1% statewide property tax to pay for soaring pension liabilities. Pritzker pitched new pension obligation bonds to investors earlier this year. If the Illinois General Assembly passes Pritzker’s amendment, voters would need to approve the change at the ballot box in 2020. The amendment would require 60 percent approval from those voting on the question, or simple majority approval from all Illinoisans voting in the election. Thankfully, there is already a reasonable path to pension reform in the General Assembly: SJRCA 9 and HJRCA 21, which would allow for similar reforms as those passed by Illinois Democratic supermajorities and signed into law by Democratic Gov. Pat Quinn in 2013. These amendments would protect already-earned pension benefits but allow for changes to future, unearned benefits – such as the current 3% compounding benefit increases throughout retirement regardless of inflation. 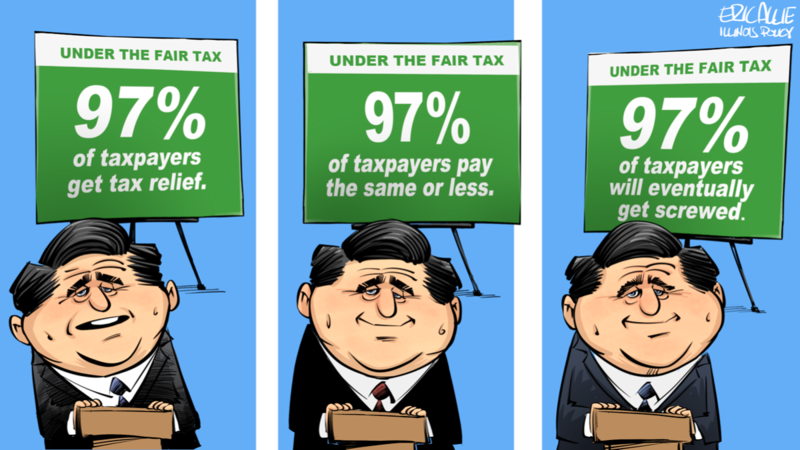 Instead of opening the door for punishing new income taxes, Pritzker needs to address the state’s spending problem at the source. P.S. Please look up your lawmaker and tell him/her to vote “NO” on the progressive income tax hike.